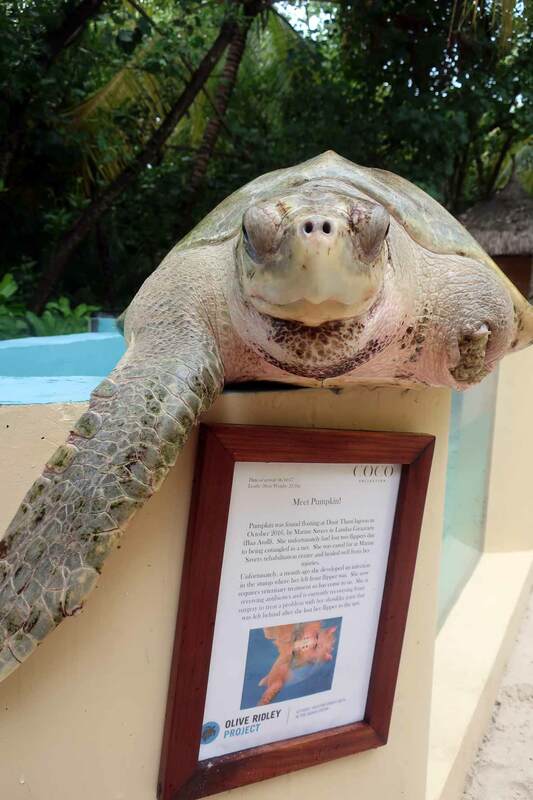 Pumpkin is a an adult female Olive ridley turtle who was found in the Dusit Thani lagoon by Marine Savers at Lana Giraavaru in October 2016. 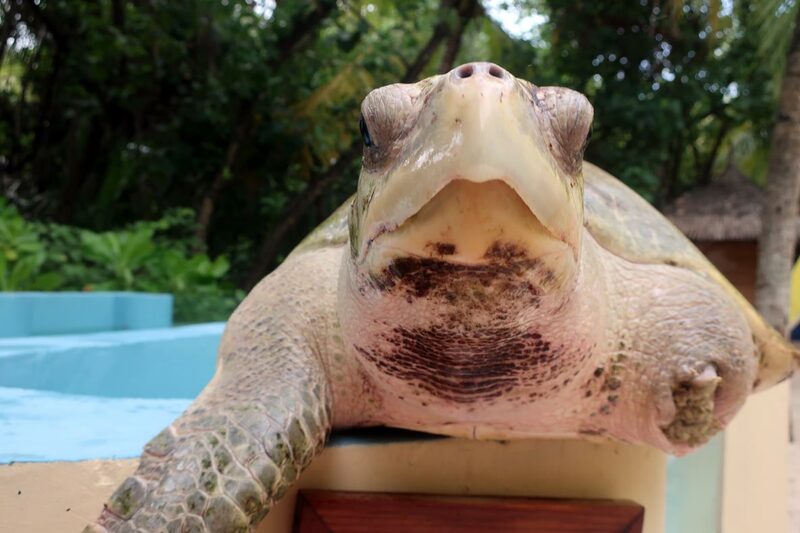 Status: Being cared for at Marine Savers Rehabilitation Centre, searching for a “forever home”. Pumpkin posing for the camera. Pumpkin just after arriving at the rescue centre. Her infected stump is visible. Pumpkin exploring her new home having just arrived at the rescue centre. Pumpkin recovering in the rescue centre tank after surgery. Her stump is healing well. Sadly Pumpkin had lost two flippers due to ghost net entanglement by the time she was rescued. 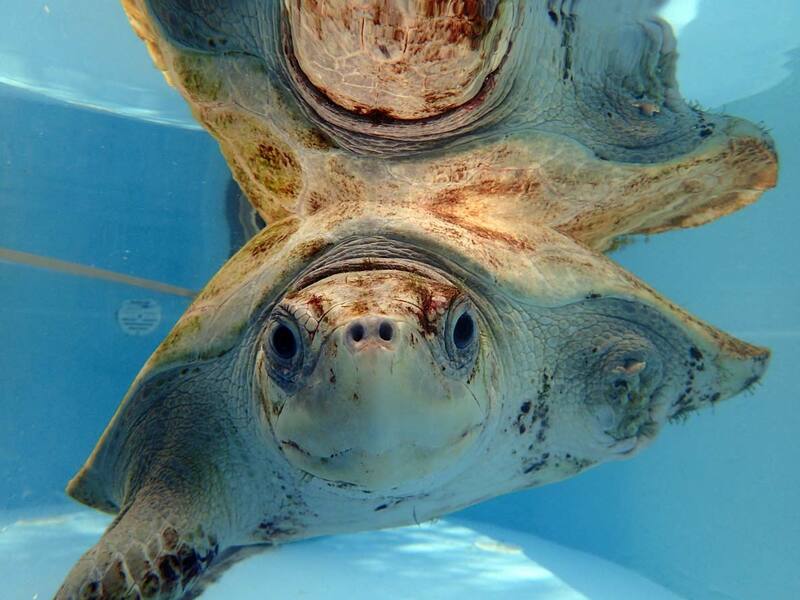 Pumpkin was cared for at the Marine Savers rehabilitation centre and her injuries healed well. However, she recently developed an infection in the stump of her left front flipper and required veterinary treatment. She was therefore transferred to us, where she had surgery and is receiving antibiotics. 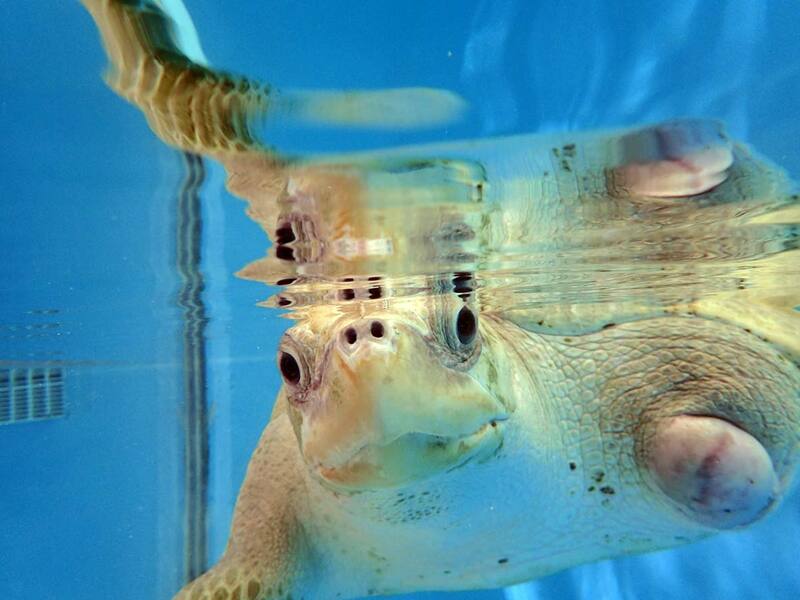 Pumpkin is a a very fussy turtle – she will only eat certain cuts of certain fish! In particular she doesn’t like tail pieces. 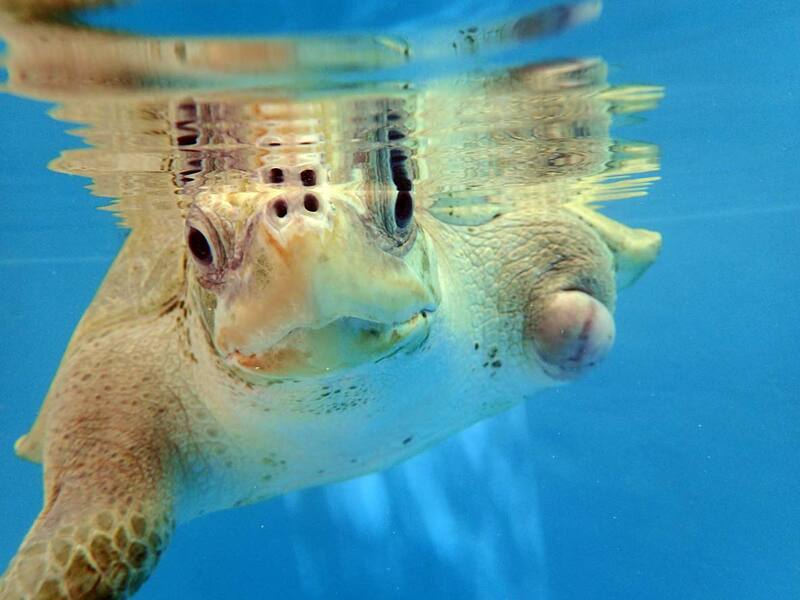 In January, Pumpkin was returned to Marine Savers. 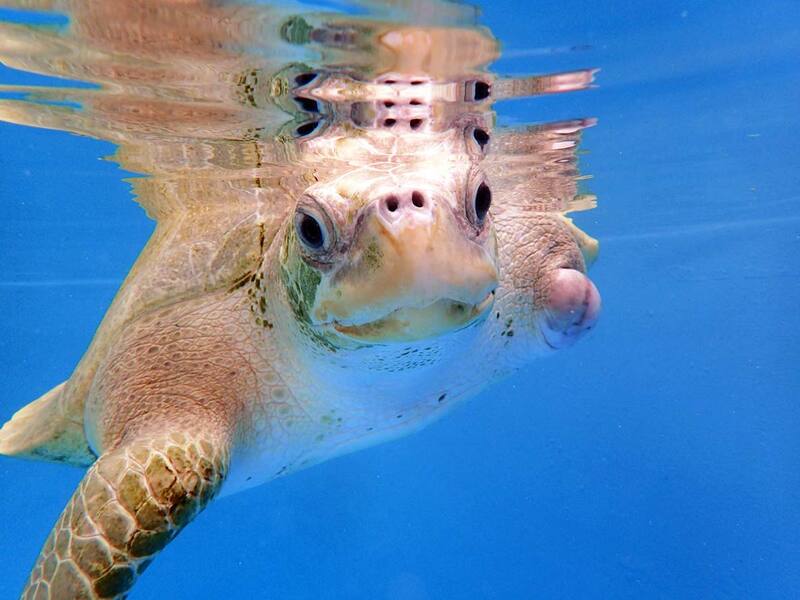 She made a great recovery from her surgery, however, she is missing two flippers and is unlikely to survive in the wild. Marine Savers are searching for a “forever home” for Pumpkin. We miss her dearly.